Description: NO New York City. Connecticut buyers must furnish us a copy of your State Issued Eligibility Permit or Ammunition Certificate, per P.A. 13-220. This listing is for ONE Magazine; buyers, however, may take any number of extras we have on hand at the same per-mag price.Buy any combination of 3 non gun non ammo items, and shipping is Free for the entire order lower 48. Llama-Gabilondo was a very credible firearms manufacturer in Eibar, Spain, and produced excellent quality pistols for almost a century, ca. 1904 until 1997. Their model III and IIIA pistols scaled the basic 1911 pattern down to a neat little pistol chambered in .380 ACP that was roughly half the size of John M. Browning’s invention. Many specimens we’ve sold in our six decades of dealing guns had no importer stamps. Most specimens from the 1970s and 1980s bore Stoeger import stamps, and then the final ones from the 1990s imported by RSA of New Jersey. Since the company went belly up in 1997, there are no more magazines. Here, then, is the only game in town, the Triple K manufactured magazine for Llama model IIIA Pistols. Manufacturer is Triple K of California. 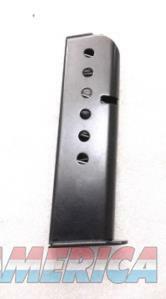 Construction is all steel magazine body, floorplate, and cartridge follower, with steel spring. Each magazine holds 7 rounds of .380 ACP caliber ammunition. Pistol may be marked 9mm Corto. That is Italian for .380 ACP. This magazine will fit Llama model IIIA , and the identical Mugica Llama model 105-G, so long as they are chambered in .380 ACP caliber. It will not fit a model XA Llama that is chambered in .32 ACP caliber. It Will Not Fit a Colt Government .380. It Will Not Fit a Star .380. It Will Not Fit the valve of a 19th Century Italian Bidet. It will only fit Llama IIIA and Mugica 105-G pistols chambered in .380 ACP caliber. Measurements are 3 7/8 inches from the top body lips to the bottom of the floorplate. Body length is 1.095 inches back to front. Thickness is .431 inch. Magazine release slot measures 2 3/16 inches from the bottom of the slot to the top of the floorplate. carbinesforcollectors com llama page has an informative comparative history. We’re offering the magazine in the photos, or one of its identical mates, for only	$ 36.00. Not for sale to residents of New York City. Any magazine deliveries into New York City require written permission from the Police Commissioner, so we cannot ship magazines into any of the five boroughs or 176 some odd zip codes, per NYC Code 10-131.10. Connecticut buyers must furnish us a copy of your State Issued Eligibility Permit or Ammunition Certificate, per P.A. 13-220. Any ammunition, firearms, or personnel showing in any of our photos are Not included. $3 Lower 48 First Class Mail Padded Envelope; $10 Priority to AK HI PR. First Class sometimes requires removing the item from its package.